I know the exact date and place and circumstance when I first read Pride and Prejudice. It was at Easter, in 1996 at my in-laws and I have two men to thank for it: my husband and Andrew Davies. Actually, I should thank my mother-in-law as well because as a former English teacher she had rows and rows of English classics on her more than well-stocked library shelves and one of them was a charming little hard-cover 1960’s copy of Pride and Prejudice with careful annotations and bright orange covers. Anyway, that copy would perhaps still be unread by me if my husband had not fallen ill with the flu and been forced to retire to his bed and stop pestering me for wintery walks and ski trips and all sorts of activities and if Andrew Davies had not produced his 1995 BBC miniseries that were shown on TV as an Easter special. Without these two circumstances, I would never have plowed through that bookshelf in search of reading and then forsaken all other alternatives once I spotted that bright little orange book. I think the miniseries was at Episode 3 or something and I could not bear to wait for the next one. I read the book instead in one sitting and I am so very glad I did! My love for Jane Austen started in the Spring of 1999, in rather unusual circumstances. A very dear friend of mine and her five children came to our house with little more than the clothes on their backs, having to flee from a troubled situation at home. We made two clandestine trips back to her house to gather clothes and personal items… the process was as follows: We would drive past the house once to make sure it was empty, then on the second pass I’d pull up in the driveway and wait with the car running while she rushed in to grab as much as she could. She’d rush back out and we’d speed off like bank robbers on the lam. “Movies?? ?” I seriously thought she had gone over the edge. I mean, who risks their life and well-being for movies? But it was too late, the car door was open and she was on her way back into the house. Moments later she came out with an armful of tapes and we made good on our escape. Turns out, the movies were video recordings she had made from PBS and A&E broadcasts (back when A&E still aired the good stuff): Emma with Gwyneth Paltrow, Branagh’s Henry V, Emma Thompson’s Sense and Sensibility, and the icing on the cake, A&E’s Pride & Prejudice. With twelve of us crammed into the house, nine of them children, movies were the only way we kept sane and kept from killing each other or each other’s kids during that long, hot summer. Almost every afternoon, we’d send the kids outside, draw the shades, grab a tall glass of ice water and let ourselves be whisked away to a more genteel and peaceful world. We watched them all, but more often than any other, we’d stick in Pride & Prejudice. We somehow survived that time. My friend and her children moved on and out of the house, but when she left, she took her tapes with her. I was glad to have my house back, but I missed the movie afternoons. I found solace in reading all of Jane’s works over and over as I checked the TV listings in hopes of catching any re-broadcasts. I was an internet innocent and never thought to search to see if the films were available to buy, but then one day I came across the 6-tape boxed set of P&P at Best Buy! For $138!!! I secretly socked away money, $5 and $10 at a time until I had enough and I marched down there and bought it. (To this day, I don’t think my husband knows just how much that first set cost.) I wore them out and they eventually had to be replaced, but by then the price was much more reasonable so I bought a second set. I bought the DVD as soon as it was released. I bought the Widescreen edition. I bought the 10th Anniversary edition. And now, I am the proud and very happy owner of the Blu-Ray! But since I’ve worn out several paperback copies of the books as well, I can convince myself that I’m quite an accomplished and well-rounded individual. So Gail & Tina are dying to know… how did you discover Jane??? It’s interesting that once you read or see P&P there’s no going back. When P&P3 came out, my Lit PHD friend made me go see it with her. It was an instant addiction. I went out and read P&P several times over and rented all the movie versions and kept going from there. I heard about Pride&Prejudice off and on through high school and college (it was never assigned to me, amazingly enough). Then I saw Emma Thompson’s Sense & Sensibility, loved it and decided to read it in its original state. 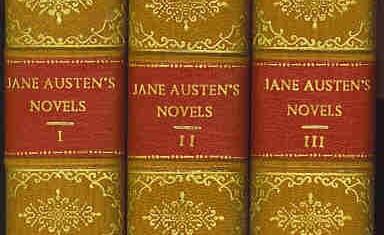 Liked it enough to read another JA novel and chose P&P, because I read somewhere that it was the third most published book behind the Bible and something else (actually I can’t find any evidence to support that now, but at the time I figured, all those people throughout 200 years of Western Civilization can’t be wrong!) LOVED IT! 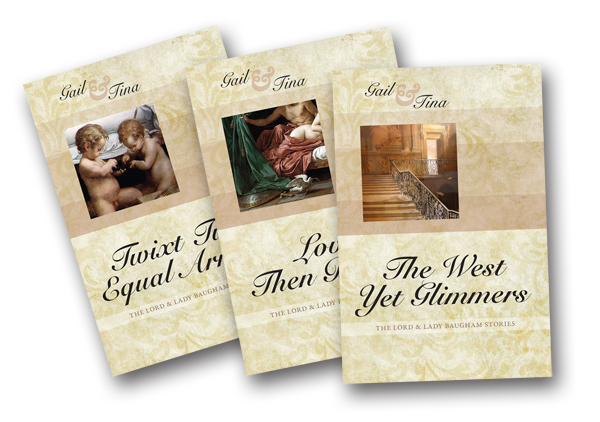 I first discovered Jane’s works as an undergraduate in English BUT I discovered my LOVE for them via the 1995 P&P mini series. 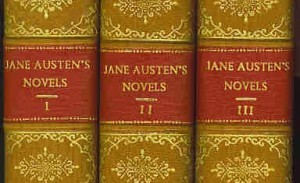 It has spiralled into an obsession I have with all things Austenian!